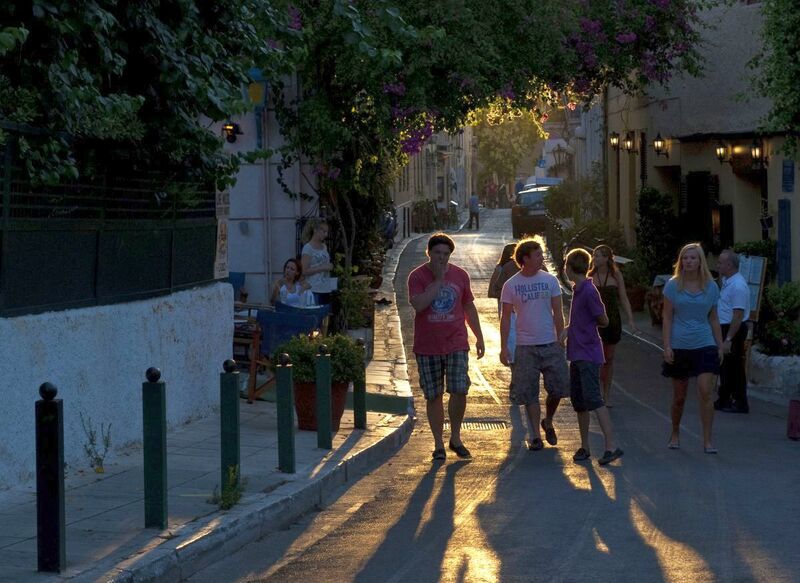 The Greek National Tourism Organization (GNTO) on Wednesday announced that it is expecting a double-digit rise in tourist arrivals to Greece this year from Austria and Norway. The announcement follows the organization’s participation in the tourism exhibitions Ferien-Messe in Vienna, Austria and Reiselivsmessen Oslo, in Norway. 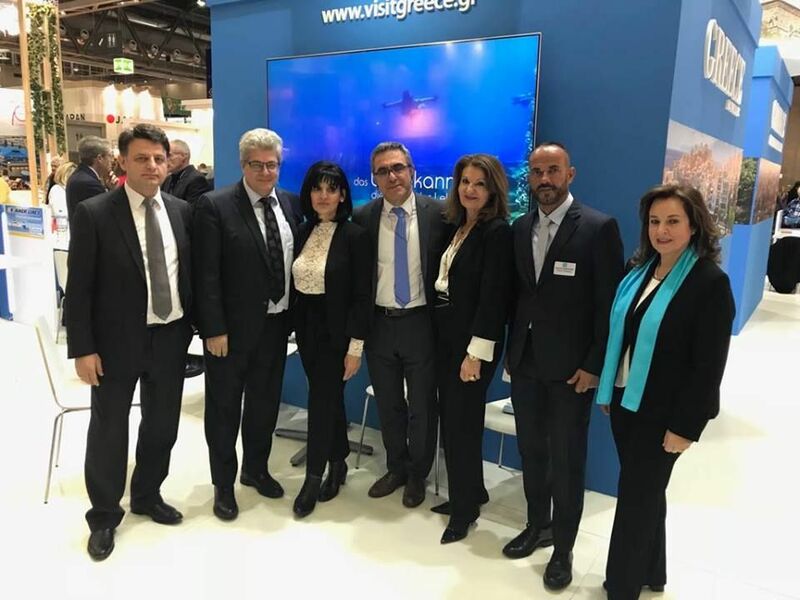 Greek stand at the Ferien-Messe 2019 expo – Nikolaos Sapoutzis, head of Greek Embassy in Vienna; Mihalis Vrettakis, economic and commercial affairs adviser; Eleni Melita, head of GNTO office in Austria; Konstantinos Tsegas, secretary general of GNTO; Eleni Gerolymatou, head of GNTO PR Department; Ioannis Rafalias, PR officer of GNTo Austria; and Mary Lemoni, GNTO Austria. “Greece holds the leading choice as a holiday destination for the Austrians in 2019, where a new double-digit increase in arrivals is expected, based on early bookings,” the GNTO said after the Ferien-Messe 2019 (January 10-13) wrapped up. According to data from the GNTO, tourist traffic from Austria is expected to rise more than 10 percent, compared to 2018 which had seen an increase in visitors from the same market against the year before. During the exhibition, GNTO Secretary General Konstantinos Tsegas met with the heads of the Austrian tourism industry, which included representatives from Austria’s flag carrier Austrian Airlines and leading tour operators such as TUI and Thomas Cook. Among other things, Tsegas discussed Greece’s prospects for 2019 and underlined the organization’s aim to extend the tourism season in Greece and attract new markets. The rising trend of bookings from Austria to Greece was also recorded by the Austrian travel agency chain Ruefa in its annual poll Ruefa Reisekompass 2019, which focuses on bookings already made by tour operators and accounts for 30 percent of the market for the summer season. “Greece’s upward trend continues,” the group’s director, Helga Freund, said. Moreover, TUI Austria has highlighted a significant increase in bookings to Greece with the company’s director, Lisa Weddig, to have had said: “Classic destinations continue to be the trend of the coming summer, with Greece, alike last year, at the top”. The Ferien-Messe 2019 tourism fair attracted 850 exhibitors from 80 countries. The GNTO’s stand hosted 18 Greek co-exhibitors. 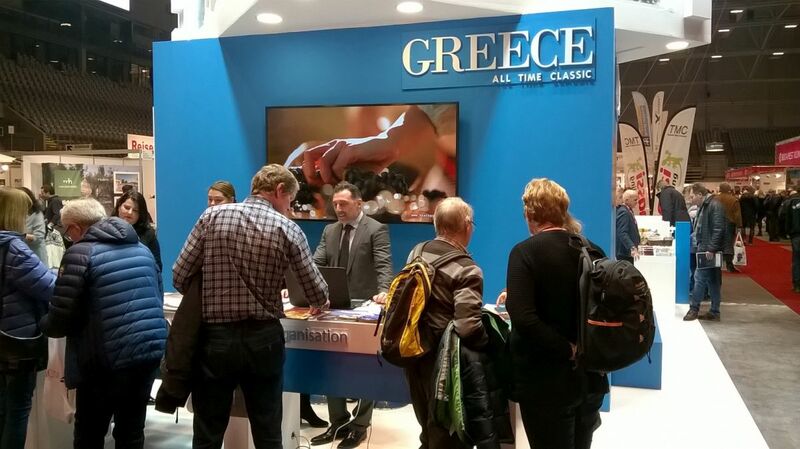 Greek stand at Reiselivsmessen Oslo 2019. The GNTO also announced that, according to data presented by Norwegian tour operators during the Reiselivsmessen Oslo 2019 tourism fair (January 11-13), Greece is expected to welcome a double-digit increase in arrivals from Norway in 2019, surpassing last year’s 11.6 percent rise. The GNTO participated in the Norewegian expo for the first time, with co-exhibitors from the Region of Crete and a consortium of hotels from Rethymnon, and was represented by the organization’s deputy secretary general, Yiannis Goulias. During the exhibition, Goulias held meetings with Apollo Travel Group’s general manager, Erik Haug and production & optimization manager, Matthias Karlsson, and discussed the possibility of launching joint promotional actions to further boost the tourist flow from Norway to Greece. Goulias also met with representatives of travel agencies that exclusively promote Greece as a destination or include the country in their travel packages, such as Hellas Spesialisten, Jomfrureiser, Peer Gynt Tours and Reisegiganten. The Reiselivsmessen Oslo tourism expo hosted a total of 177 exhibitors from around the world and attracted over 30,000 visitors.